Naka-gawa (Naka river) is a big river flowing north of Mito city where I live. 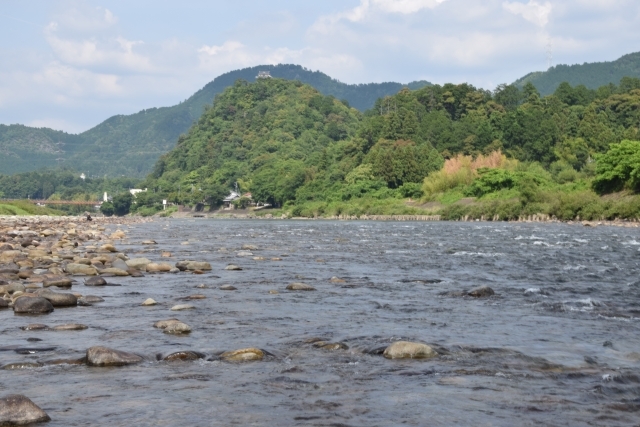 The river is famous as Japan's southernmost river where natural salmon runs up. 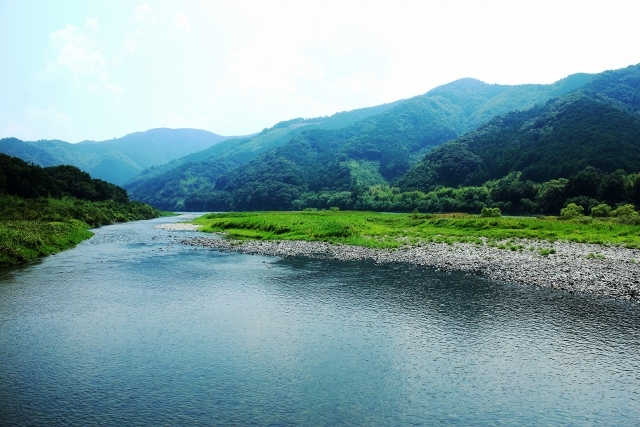 I said “big river”, but driving 20 or 30 minutes up-stream from Mito by car, the river appears like seiryu (clear stream) and it would be a good area for Ayu fishing or small fish fishing such as Yamabe (Hae) or Haya (Ugui). Ymamabe (Hae) is Pale Cub and Haya is Japanese Dace in English. When I was a kid, I sometimes went Yamabe fishing there with friends. The fishing method we did in those days was bait fishing using a float, and we called it “Nagashi-zuri”. Nagashi-zuri means flowing fishing because we cast the bait and float up-stream and flowed it to down-stream. The fishing was repeating of that action changing the places. Bait was Sashi (Fly larva) sold at fishing tackle shops. Sometimes we did local way of fly fishing at the riffle with a line system that tied small flies in 5 or 6 branches. 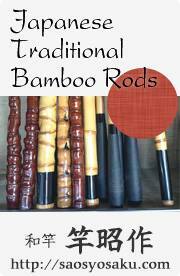 We used cheap bamboo rods like 3.0m long firstly, and reasonable fiberglass rods took place when we grew up. The average size of Yamabe was 10-15cm but sometimes we hooked more than 20cm Haya and got excited with the fight. I think we started Yamabe fishing probably around the end of March when we were on the spring break, and in the beginning of May the temperature went high quickly and fields and the forests along the river became the season of flesh green. Early summer had come. 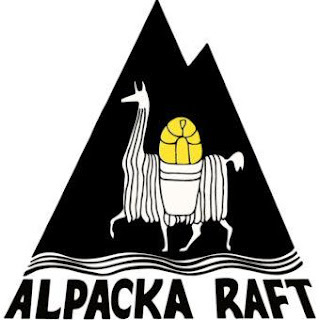 It was the time playing in mountains and rivers became very enjoyable. The activities of Yamabe were also improved, and we enjoyed the best fishing of the year. This was also the season when the young Ayu (sweet fish) about 10 cm from the sea ran up, and we fished them often while doing Yamabe fishing. In fact May was still off-season for Ayu fishing, and also we had to purchase expensive fishing tickets for ayu fishing. However, at that time the Japan was still quite big-hearted and the fishing surveillance agent, occasionally came over, also turned blind eye to 10 or 15 ayu children caught. It was good old days. We took the caught fish home, and Ayu was very pleased with family. Tempura of ayu which my grandmother cooked for that night was rich in flavor and so delicious even for me who was still a kid. Yamabe was not that popular like Ayu. So we released them to the river after fishing. I am reminded of the beauty of male Yamabe shining glitteringly in 5 colors in the sunlight. The fish we called “yamabe” is also called “hae” in Kansai (Western Japan) area. Nowadays many fishing rod companies produce “Hae rods”. May be “Hae” is much more familiar to you. When we were kids, there were no carbon rods and still fiberglass rods are very expensive. Probably there were Hae rods used by some adult fishers but we never heard of Hae rod. 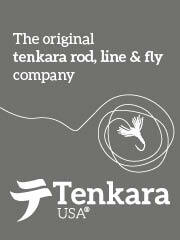 It has been a while since some tenkara fishers started to use these Hae rods for light level line tenkara fishing. As I wrote, Yamabe (Hae) is small fish of 10-15cm. The Hae rods designed for bait fishing and its rod action is stiff fast action can be used like nice slow 6:4 action tenkara rods. Hae rods are really good to cast light level lines such as 2.0 or 2.5 Go lines. However, it is better to choose a strong body rod for places where big trout can be caught. One more advantage of Hae rods is its light weights. If a 3.9 m Tenkara rod is about 80 g, a same length of the Hae rod weighs 50 - 60 g. We do not get tired casting a Hae rod all the day. A friend of mine Go Ishii-san uses Daiwa Rinfu 4.0-4.5 rod for level line tenkara fishing favorably. I sometimes use a Hae rod for Yamame fishing in small streams too. 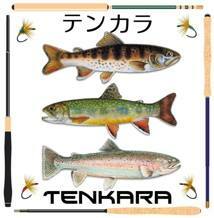 I notice some western anglers use Keiryu rods for tenkara fishing, but Keiryu rods are designed to be stiff fast action and it is not comfortable for tenkara casting. We do like under hand cast to do keiryu bait fishing with a keiryu rod. We can use Keiryu rods for Chochin-zuri. (Kebari fishing with very short line. No casting. Just like putting Kebari on the current. 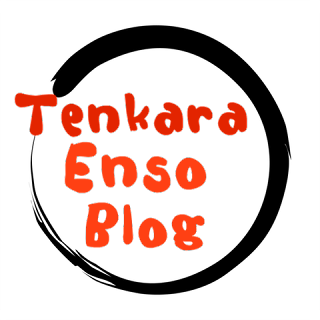 ), but never use for tenkara fishing. On the other hand Keiryu rods are good for nymphing. If you do nymphing with the same line system as Japanese keiryu bait fishing, you can enjoy very nice nymph fishing. I think it might be better than nymphing with fly rods because of the length of the Keiryu rods. Although the talk took a while on the sideways, in Japan Iwana and Yamame fishing are banned during winter time, but Yamabe fishing can be enjoyed throughout the year. Of couse Yamabe are not active in the mid-winter, but we could enjoy Kan-baya (Winter Haya) fishing then. Keiryu fishing for Iwana or Yamame starts from 01 April in our areas. It is still ahead, but I am in the mood to go out fishing for Yamabe for the first time in decades in this coming March when sunshine becomes like spring. Could I still meet the kids who are enjoying Yamabe fishing like us in those days?